For a blockchain project looking to launch an ICO, a good whitepaper can mean the difference between success and failure. Here are some insights into the prevailing industry standards with regard to crafting a whitepaper that effectively communicates the technology behind the project and garners interest from potential investors. 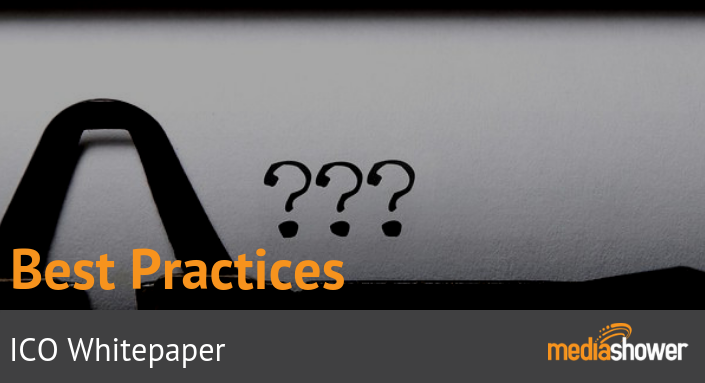 There are several factors to consider prior to the creation of a whitepaper. First, a good whitepaper will not help a bad project. Develop your idea thoroughly before you embark on publicizing your project in the attempt to garner interest and investment. The hallmark of a good project is the filling of a market gap. Another way to decide if your blockchain-based project is superior is if it expands on prior innovations or can be considered as the logical evolution of the sector. Moreover, it has been common in the past for projects to run an ICO without a prototype of their platform or product. However, this practice has come under fire and is now considered a faux pax. It is best to have a demonstration of your platform to show that you are invested in the project and are not trying to fleece people through an ICO. A good public relations strategy is also key. Once you have figured out every important detail of your project and included this information in the whitepaper, then you should consider engaging with or employing other methods to publicize your project. Lastly, it is important to have a professional footprint on the Internet. A secure, user-friendly website and active social media pages are imperative. The purpose of a whitepaper is to educate and inform. To achieve these goals, it is important to consider the eloquence of the writing in the paper. If your team is unsure of its technical writing abilities, then you should consider employing a person or firm with experience in this sector. Expressing the ideas, principles, and inner workings of the project in the simplest way without diluting anything is key. It is better to use simpler words than to use complex wording where it is unnecessary as this will likely confound the reader while also increasing the likelihood of a misunderstood whitepaper. Thus the first essential component of a good white paper is eloquent writing and a clear structure. and explain how your project will fill the gap. A project working to meet a need is more likely to succeed than one that is not. The problem statement and proposed solution is similar to an executive summary and should be right at the beginning of the paper. It should be presented in a precise and succinct way. The body of the whitepaper should contain detailed information about the project. This information should include the technology upon which your product is based. Is your project utilizing a blockchain? Or is it using another type of decentralized ledger? What is the consensus mechanism in use? Is your platform a DApp based on another blockchain? If your project is introducing a new technological innovation, then it is imperative to describe it in exacting detail. This includes any new definitions that you have created. The token is a very important feature in cryptosystems. It is essential to describe every detail pertaining to the token native to your project. How does the token fit into the platform? Is it a utility token? How can users get a hold of the asset? How does your consensus mechanism affect token mechanics? Additionally, because you are looking to hold an ICO, it is important to have transparency as to how the token will be distributed. Will there be a pre-sale? If yes, who is eligible? Are there any tokens held back for the founding team? Is there a maximum supply? At what price will the tokens be sold? Additionally, it is also important to detail how the funds raised in the ICO will be used. Transparency inspires confidence which is an essential part of raising more funds in your upcoming ICO. This section can be detailed in the developmental road map, which is another essential part of a good whitepaper. Demonstrating future plans is important to inspiring confidence. Lastly, a good whitepaper should have a section which focuses on the team behind the project. While a number of projects released in an anonymous manner have gone on to be successful, you have a greater chance of success in your ICO if you reveal the identities of those in your team as well as their experience. This serves to inspire confidence and as referenced earlier, this is better for your project. To learn more about how to market your token sale, download our ICO marketing spreadsheet or contact us!